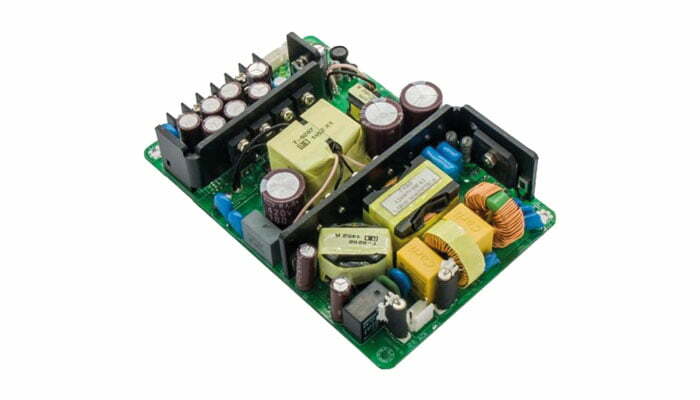 RJ-360P Series are Single Output 360 Watt Medical Power Supplies, available in an open PCB format. RJ-360P series 360 watt medical power supplies have Universal AC Input from 90-264VAC with outputs of 12V, 24V, 28V, 48V and 54V. RJ-360P series 360 watt medical power supplies have approvals to the UL60601-1 3rd Edition, CSA22.2, No. 60601-1 3rd Edition and EN60601-1 3rd Edition standard, offer Class B line emissions and will operate over a wide -20°C to +70°C ambient temperature range. Safety Standards Medical: UL60601-1 3rd Ed., CSA22.2 No.60601-1 3rd Ed., EN60601-1 3rd Ed. ITE: UL60950-1 2nd Ed,, CSA22.2 No.60950-1 2nd Ed., EN60650-1 2nd Ed. 1. Output connector options: x=T - Terminal block type, pitch 8.25mm - Suitable for all voltages | x=C - Connector type, pitch=3.96mm - Suitable for 24V up. 2. All models are equiped with 5V/0.3A standby & 12V/0.3A fan outputs. 3. All models have total power 250W Max. convection or 360W Max. with 20CFM forced air cooling.